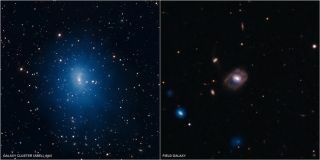 This two-panel graphic contains two composite images of galaxies used in a recent study of supermassive black holes. In each of the galaxies, data from NASA's Chandra X-ray Observatory are blue, and optical data from the Sloan Digital Sky survey are shown in red, yellow and white. The galaxy on the left, Abell 644, is in the center of a galaxy cluster that lies about 920 million light years from Earth. On the right is an isolated, or "field," galaxy named SDSS J1021+1312, which is located about 1.1 billion light years away. At the center of both of these galaxies is a growing supermassive black hole, called an active galactic nucleus (AGN) by astronomers, which is pulling in large quantities of gas. Some of the giant black holes that lurk at the center of galaxies are more lively than others, and the most hyperactive of these black holes put on showy displays, burning bright with X-rays as heated gases are sucked into their darkened hearts. Using the combined forces of NASA's Chandra X-ray Observatory and optical images from the Sloan Digital Sky Survey, scientists analyzed 100,000 galaxies in a huge swath of sky. Only about 1,600, or one percent, of the galaxies surveyed were bright in X-rays — a telltale sign of heightened activity at a galaxy's center that suggests a black hole in its most hectic phase. "Trying to figure out how many of these black holes are active at any time is important for understanding how black holes grow within galaxies, and how this growth is affected by the environment," said Daryl Haggard of the University of Washington in Seattle and Northwestern University in Evanston, Ill., who led the study. Haggard and his team looked only at loner galaxies — as opposed to galaxies grouped together in clusters — focusing the research primarily on those galaxies within 1.6 billion light-years of Earth, although galaxies as far away as 6.3 billion light-years were studied. They discovered that a galaxy's mass is correlated with the activity of its black hole; the more massive galaxies are far more likely to house a feisty center. In addition, researchers found that since the Big Bang, the percentage of galaxies that host hyperactive black holes has gone down — which implies that either the fuel supply or the fueling mechanism for the black holes is changing with time. The study also has important implications for understanding how the company a galaxy keeps affects the growth of its black hole. It turns out that loner galaxies and galaxies in clusters are equally likely to house an active black hole. "It seems that really active black holes are rare but not antisocial," Haggard said. "This has been a surprise to some, but might provide important clues about how the environment affects black hole growth." Most galaxies are thought to house giant black holes in their centers, including our own Milky Way. While our galaxy's supermassive black hole is not overly active now, it could ramp up in the future, scientists say. If that happens, life on Earth isn't in any danger. In fact, from our safe vantage point on the outskirts of the Milky Way, we'd get a spectacular show in the X-ray and radio wavelengths, according to astronomers. However, for any planets closer to the galaxy's center, the news isn't so good — they could receive large and potentially damaging amounts of radiation.